In March and April McLaren took the band on a tour of South Carolina and Florida. Jordan replaced Kane for most of those shows. Thunders and Nolan left after an argument with Johansen. Blackie Lawless replaced Thunders for the remainder of the tour after which the band broke up. By 1975 the Dolls were playing smaller venues than they had been previously. Drug and alcohol abuse by Thunders, Nolan and Kane as well as artistic differences added to the tensions among members. In late February or early March Malcolm McLaren became their informal manager. He got the band red leather outfits to wear on stage and a communist flag as backdrop. The Dolls did a 5-concert tour of New York's five boroughs, supported by Television and Pure Hell. The Little Hippodrome (Manhattan) show was recorded and released by Fan Club records in 1982 as Red Patent Leather. It was originally a bootleg album that was later remixed by Sylvain, with former manager Marty Thau credited as executive producer. Due to Kane being unable to play that night, roadie Peter Jordan played bass, though he was credited as having played "second bass". Jordan filled in for Kane when he was too inebriated to play. A posthumous New York Dolls album, Lipstick Killers, made up of early demo tapes of the original Dolls (with Billy Murcia on drums), was released in a cassette-only edition on ROIR Records in 1981, and subsequently re-released on CD, and then on vinyl in early 2006. All the tracks from this title – sometimes referred to as The Mercer Street Sessions (though actually recorded at Blue Rock Studio, New York) – are included on the CD Private World, along with other tracks recorded elsewhere, including a previously unreleased Dolls original, "Endless Party." Three more unreleased studio tracks, including another previously unreleased Dolls original, "Lone Star Queen," are included on the Rock 'n' Roll album. The other two are covers: the "Courageous Cat" theme, from the original Courageous Catcartoon series; and a second attempt at "Don't Mess With Cupid," a song written by Steve Cropper and Eddie Floyd for Otis Redding, and first recorded independently for what was later to become the Mercer Street/Blue Rock Sessions. On March 1, 2011, it was announced the New York Dolls would be the opening act for a summer tour featuring Mötley Crüe and Poison. They announced a new lineup for the tour, featuring guitarist Earl Slick, who held previous stints with David Bowie and John Lennon, bassist Kenny Aaronson, who had toured with Bob Dylan, and drummer Jason Sutter, formerly of Foreigner. In a 2016 interview with Getintothis, Earl Slick confirmed the band was over. "Oh, yeah, it’s long gone. There was no point in doing it anymore and it was kinda spent. You know, David really does enjoy the Buster thing. He’s so good at it. I’ve seen him do it a couple of times this last year, and man! He’s got it down, you know." Certainly neither great nor punk in any of its variations were words applied to the Dolls when they began performing late in 1971 — awful and ugly were more like it. Moreover, at the time, the Dolls were associated with glam-rock and David Bowie in his most flamboyantly gay period, an understandable mistake. 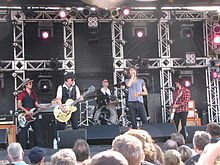 According to AllMusic editor Stephen Thomas Erlewine, the New York Dolls developed an original style of hard rock that presaged both punk rock and heavy metal music, and drew on elements such as the "dirty rock & roll" of the Rolling Stones, the "anarchic noise" of the Stooges, the glam rock of David Bowie and T. Rex, and girl group pop music. Erlewine credited the band for creating punk rock "before there was a term for it." Ken Tucker, who referred to them as a proto-punk band, wrote that they were strongly influenced by the "New York sensibility" of Lou Reed: "The mean wisecracks and impassioned cynicism that informed the Dolls' songs represented an attitude that Reed's work with the Velvet Underground embodied, as did the Dolls' distinct lack of musicianship." When they began performing, four of the band's five members wore Spandex and platform boots, while Johansen—the band's lyricist and "conceptmaster"— often preferred high heels and a dress occasionally. Fashion historian Valerie Steele said that, while the majority of the punk scene pursued an understated "street look", the New York Dolls followed an English glam rock "look of androgyny—leather and knee-length boots, chest hair, and bleach". 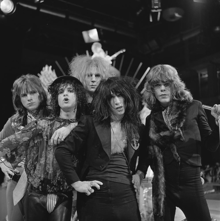 Music journalist Nick Kent argued that the New York Dolls were "quintessential glam rockers" because of their flamboyant fashion, while their technical shortcomings as musicians and Johnny Thunders' "trouble-prone presence" gave them a punk-rock reputation. By contrast, Robert Christgau preferred for them to not be categorized as a glam rock band, but instead as "the best hard-rock band since the Rolling Stones". Robert Hilburn, writing for the Los Angeles Times, said that the band exhibited a strong influence from the Rolling Stones, but had distinguished themselves by Too Much Too Soon (1974) as "a much more independent, original force" because of their "definite touch of the humor and carefreeness of early (ie. mid-1950s) rock". Simon Reynolds felt that, by their 2009 album Cause I Sez So, the band exhibited the sound "not of the sloppy, rambunctious Dolls of punk mythology but of a tight, lean hard-rock band."